Warning: This spacesuit not intended for space. 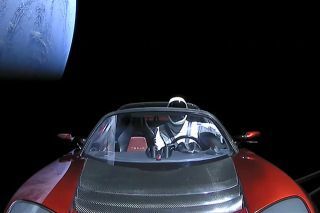 If you hope to someday take a profile pic that looks as majestic as the convertible-driving, spacesuit-wearing mannequin known as Starman that was just launched into space, we have some bad news for you. For starters, cosmic radiation will probably rip that cherry-red convertible to bits within a year. And more importantly, wearing a suit like Starman's in space would probably kill you in minutes. This is good news for the non-mannequin cosmonauts who might wear similar SpaceX suits aboard a capsule bound for the International Space Station later this year. But in low-pressure environments, like the vacuum of space, humans run into all sorts of bodily problems: trapped gases expand, oxygen (O2) doesn't flow properly and unconsciousness is imminent. Suits like Starman's are designed to provide a backup source of pressure to keep astronauts safe in the event of a sudden spacecraft cabin depressurization, John Charles, president of the Space Medicine Association, told Live Science in an email. There are more dangers to space than vacuums, however, and it's not likely that you'll see a real astronaut braving space in such skimpy attire as Starman's. According to Musk, the SpaceX suit is intended for intravehicular use only. Wearing a suit like Starman's on an actual spacewalk would not only expose the wearer to stellar selfie opportunities, but also — and more importantly — to temperatures ranging from 250 degrees Fahrenheit (121 degrees Celsius) to minus 250 degrees F (minus 156 degrees C), a bath of unobstructed stellar radiation and a dearth of oxygen that would leave a real astronaut dead within minutes. "Obviously, the SpaceX suit — and any other suit — by itself would be useless without the spacecraft or portable life support systems to make it functional," Charles said. "Without a life support system to supply pressurization and O2, as well as CO2 [carbon dioxide] removal, you're not going to last long at all due to anoxia (lack of oxygen), hypercapnia (too much CO2) and ebullism (gas bubbles in the blood)." Even with all this gear, though, astronauts would still be vulnerable to the severe temperatures and radiation of space, Charles said. "When NASA was looking at flying [ACES] aboard Orion for the asteroid redirect mission, the plan was to upgrade the ACES to the MACES with modified gloves, a thermal and micrometeoroid outer garment and a portable life support system to perform just a couple of extravehicular activities (EVAs)," Charles said. "So, using a launch/entry suit in space is feasible, but again, it’s all about the environment and life support supplies," Charles said. Godspeed on your long journey toward Mars, Starman. We hope you packed a radiation-resistant sweater.